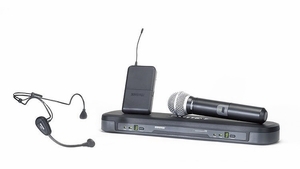 The PG1288/PG30 Wireless Headset System includes PG88 Dual Diversity Receiver, PG1 Bodypack Transmitter, PG2/PG58 Handheld Microphone Transmitter, and PG30TQG Headset Microphone. It is comfortable and reliable for active users. PG88 DUAL RECEIVER FEATURES: Internal Antenna Diversity; Dual receiver with up to 10 selectable channels per side; 4 compatible dual receivers; 1/4" and XLR output. HANDHELD TRANSMITTER FEATURES: Power, mute and battery status LED; Power and mute switch; 9V battery provides 8 hours of battery life; 75m (250 ft.) operating range. PG30TQG HEADSET CONDENSER MICROPHONE FEATURES: Smooth, natural frequency response comparable to quality handheld microphones; Reliable at temperature and humidity extremes.